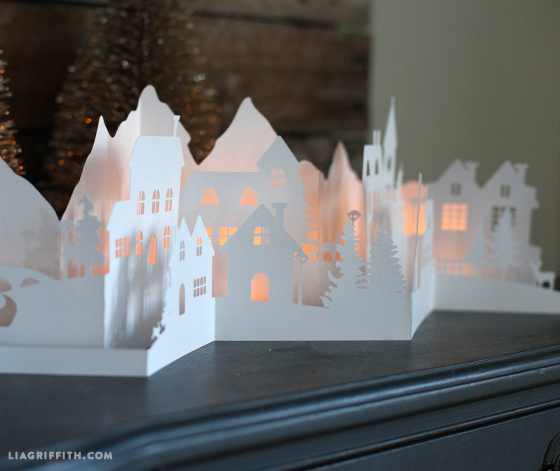 This simple winter village decoration is so easy to make if you have a personal cutting machine. It can also be cut by hand if you have a steady arm and some patience! 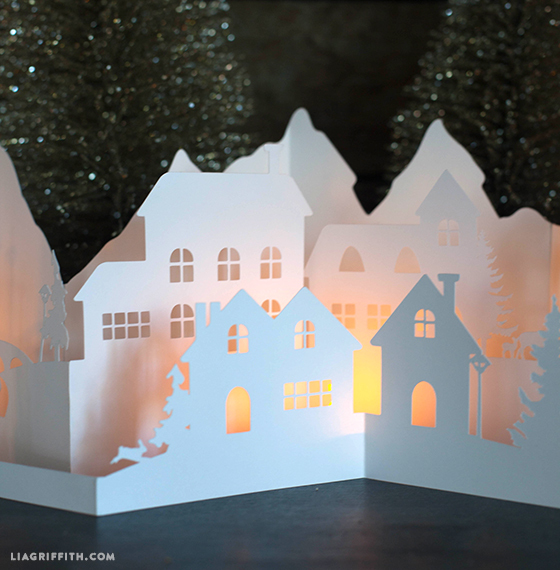 You all loved our Halloween paper cut village so we knew we had to out do ourselves and design a winter village for the holiday season. We took it one step further this time around and created a design that is not only one layer of paper but three. This winter village has a mountain scape in the background with little village houses, clock towers, light poles and trees in the front two layers. The cut also features a bridge and deer, a rabbit and fox. 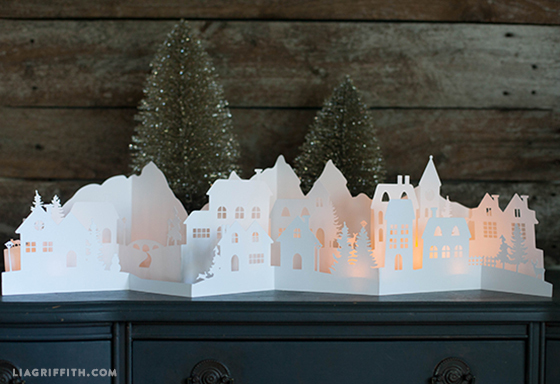 These are a perfect match for the gorgeous paper cut lanterns. Cricut Cutting Machine – optional! I love this style of decor because it works well as winter decor from Fall through January. If you store it carefully, it will be a perfect winter decoration for many years to come. 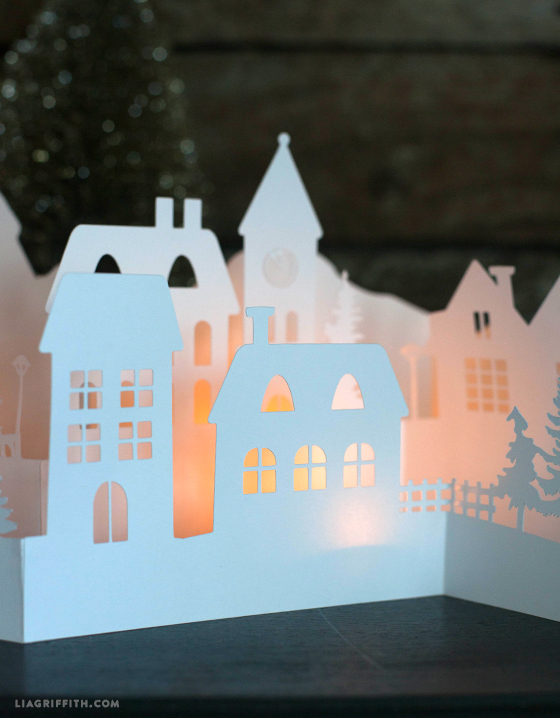 Though we did cut our village on our Cricut Explore, you can use the SVG files for any cutting machine. For this village an 8.5×11 white card stock works well. For those of you who like to hand cut, we are also offering the printable template. Just use the buttons below to download. Another winner with huge impact. Fast and easy to make and a beautiful accent for our holiday party. Thank you! So I downloaded. How do I then make it work to cut on the Cricut? It doesn’t have those guide lines on it like what you showed on the Cricut video. Help. Hi Janet, do you have a Cricut Explore? You’ll need to upload the SVG file to Design Space. If you’re new to cutting on the Cricut you’ll want to familiarize yourself with the software (it’s much easier than it looks!) There are some great videos on Cricut’s YouTube channel. Hi, Lia–I’m a new annual member! I’m so excited to have access to so many beautiful craft ideas. I’m having trouble seeing the hand cut lines on the PDF–do you have any suggestions? Welcome!! Try printing the PDF on the “best” setting on your printer. I hope that helps! I keep finding links to this being a free file but when I click on it, on this page, it say a membership is required? Thanks for the comment! Last year we made some changes to our site and now offer all our downloads and patterns for a small fee (http://liagriffith.com/membership/). The Pin’s and reposts may still indicate it’s a free site which unfortunately is just out of date. We do have many free projects under the FREEBIES tab! Thank you! this is gorgeous! I think this is going to be the best $55 I have every spent! I’ve never done paper cutting before and don’t have any of the machines to do so. So I will have to use a sharp knife to cut it all out. I have no clue where to start. Are the red lines special? I bought some 8.5×11 card stock paper. Does each of the templates represent p page of the card stock? when all the lines are cut do you then glue each of the pages together? Hi! Yes, each page of the download is 8.5×11. So you can print each page on the cardstock, and cut it out. The pink/red lines are score marks, which is where the paper should fold. You could fold the paper in place before or after you cut (and the lines are approximate; the design won’t be ruined if you don’t fold exactly in that spot). Tape the designs together from end to end, and refer to our photos as you go! Hello, Lia! I really liked this design and would like to cut it with my Silhouette Cameo. I tried to used .pdf and .svg files, but they can’t be used by my programm Silhouette Studio. Is there some way around? Please help! I think with the Silhouette you need to use their Designer Edition software, their customer service team would know. 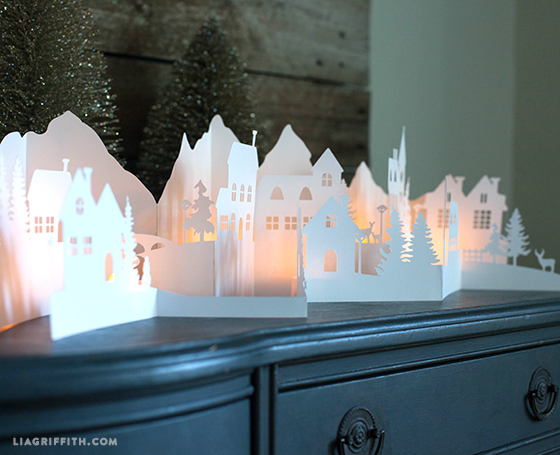 This Winter cut out is stunning. It will be the first thing I do on my new machine when it arrives. Thankyou. Thank you and congrats on your new machine, possibilities really are endless! Thank you so much. This was definitely one of my favorites for the winter season! Oh my goodness! Where was I in November?!? I am saving these for next winter! Beautiful! Thank you! Thank you this link works! This is so delightful. I will need to cut this by hand and when I open the template, all the pages are blank except for page 4. I would so like to cut this out and display. Can you help me? You are so very talented and generous with your patterns. Maybe try with a different internet browser. – soit vous téléchargez et installez sur votre PC le logiciel Inkscape (gratuit) qui vous permettra de convertir les fichiers .svg au format .sst que votre logiciel Silhouette sait ouvrir. Yes I do. A few things, make sure it is housed properly. As in clicked into place. Also, once you change the lines to score, you will need to group both the cut lines and the cut lines for each page. Fortunately this project folds easily enough. I’m cutting this in Sure Cuts A Lot 3 because my cameo won’t cut it in the design studio…is there anyway you can make the line that is to fold disappear for me or make it a dotted line so it doesn’t cut the image? I can’t erase it myself 🙁 This is so beautiful! It should work in Silhouette, you need to contact their customer service team and see if they can help you trouble shoot. I don’t have a Silhouette so I am not much help. Hope they can get it to work! Thank you so much ! This is just what I was looking for,it even has a bunny , perfect! Love this. I’m cutting this out using an Exacto knife. I have about three pages done now. Wanting a little sparkle I’m covering each section with a sheer sparkle crafting spray. I also left the clock tower door “open” instead of cutting the whole thing out. Really having fun with this project! I decided to start working on these after making the metallic paper pine cone ornaments. Your webpage might have just become an obsession for me. Wow! I want to see photos when you are done. The glitter will look perfect for the snowy scene. Hugs! Thank you Thank you Thank you!!! I just needed the upgrade! Thank you Lia, for being so generous with your talent! I have confirmed, the file is not corrupt, at least when loading into the Explore. Are you using Silhouette Design Studio upgrade? That is the only way the Cameo allows you to import SVG files. Hi Lia, thank you so much for your help! Hi! It looks beautiful but I can’t open it with Silhouette Studio. Is there anything I have to do to get it into Silhouette Studio? I am not a good resource for silhouette studio as I don’t use it. I do know it should take SVG files, so maybe look for a video tutorial on YouTube. I Cut this and it is beautiful! Thanks for sharing. I was thinking it would be great to do this concept for a nativity. I don’t have the skills to do it though. Any chance you could do that in the future? I think it would be amazing, as all of your designs are. Thank you for sharing this beautiful village! Enjoy it. You are going to love it!! Your Village is truly inspiring to us all. Thank you so much!! I am sure your family member will really appreciate your thoughtful gift! I just put this together. It is stupendous! Just what I needed. I would like to remind everyone to make sure that the fold lines are set to SCORE in the Design Space program so you can cut it on your Explore. I for got for the first 2 mats and just used tape to put it together. Then I changed it and it cut great. Thanks so much for this lovely file. This is beautiful! I know what I will be working on today! This is so beautiful! I’m hoping to make a few this weekend! You make it so easy to make such pretty things! I appreciate it so much since I work full time. What do you use to light the village. I’m afraid small battery candles will make the village look like it’s on fire. Do they make some that don’t have a twinkling flame? Hi Rhonda, thank you for your comments. So sweet:) I actually use the small battery candles with the twinkling flame for mine but I know they sell them without the twinkling flame for Halloween and Christmas. This is beautiful, Lia! Do I set each piece to 11″ wide in Design Space if using the Cricut Explore? With the Explore I should make the width all the same such as 10.25 and let the height auto adjust? I need to know the width and length of each page for the Explorer. I know I need 8 1/2 X 12 paper but need the measurements. Thank you! I look forward to making this. We printed 10 1/2″ on a 11″ width paper. Thank you so much, I love this and have scaled up to my preferred size easily. You are very gifted and generous. Thank you for sharing. I get that the red lines are for scoring and the 3 layers but are some of the pieces attached to each other in each layer? It looks like it from the pictures. . There are three rows, each row has 3 pieces glued together. Hope that helps! Thank you so much for sharing. You’re terrific! Just beautiful! I love every little detail! And after winter season you can fold it and storing is no matter until next winter. Thank you for sharing it with us! Lia what do you use to cut the fine details? Honestly I use the Cricut explore to cut for me. If you are cutting by hand you should try an exacto knife since there are a lot of details. This Winter Village is fabulous! Thank you Lia. 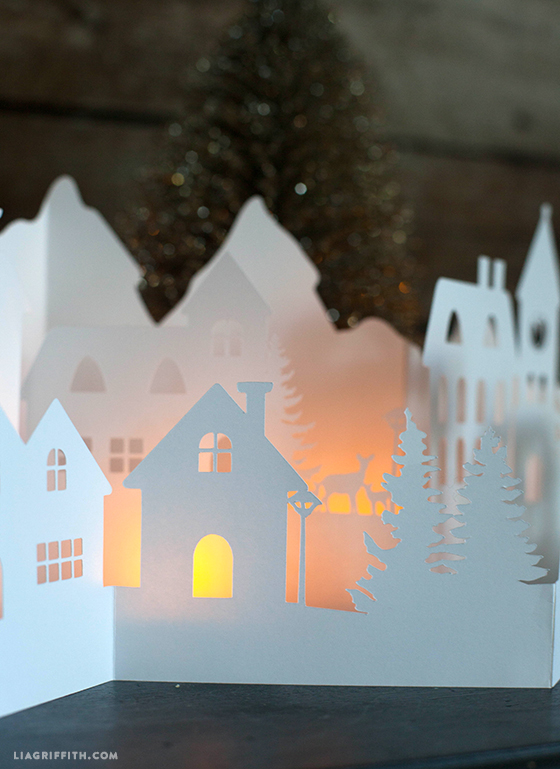 The lines for the papercut lanterns are dark and crisp; for this handcut village the line drawings for the handcut templates are palest grey and difficult to see. Can you fix that? This village is a beautiful must-have! Thank you for all of your creations!!! We made the cut lines black and re-uploaded it so give it a try! beautiful! However I have a problem with svg file. I’m not able to open it in corel draw neither in my silhouette. is there anything I’m doing wrong? The svg file isn’t designed for corel, for the silhouette you need to make sure you have the upgraded design software. Silhouette’s customer service team should be able to help you! Each piece goes on a 8 1/2×11″ full size:) Enjoy! 2) Which pages would you suggest if I wanted to make a smaller ,1/3rd size version for my door window? I think scaling all of them down would lose the effect? Thank you so very much, you do a beautiful job. GOD bless. So adorable! Thank you for sharing the file.